The Food Section linked today to a highly disturbing article from the Wall Street Journal. Lauren Etter reports that due to rising demand for corn-based ethanol, a biofuel subsidized by the U.S. government, corn prices have risen so much that farmers are seeking other foodstuffs to feed their livestock. The result? Pigs and other animals are increasingly being fed "cookies, licorice, cheese curls, candy bars, french fries, frosted wheat cereal and peanut-butter cups" and other "human" junk food as a main part of their diet. Some farmers even feed piglets a "Cocoa Puffs"-like mixture of chocolate powder and cereal. Why is this so shocking, when humans eat this stuff every day? I'm not a nutritionist, but it is generally accepted that junk food is not good for you and is only acceptable as part of a balanced diet. According to the WSJ article some farmers are using 100% "byproducts" to feed their livestock. I accept that this may be a passable way to put flesh on the bones of these animals in terms of food safety (without considering animal welfare), but I don't eat cheesies and trail mix all the time and I don't want to eat an animal that has, either. Lauren Etter also commented that "Thanks to the ethanol rush, the price of a bushel of corn for months has hovered around $4 -- nearly double the price of a few years ago. That has prompted livestock groups like the National Cattlemen's Beef Association and the National Chicken Council to call for an end to federal ethanol subsidies, including a 51-cent-per-gallon tax credit offered to companies that blend gasoline with ethanol. For now, livestock must pay up or make do with alternatives." Of course farmers are concerned about their bottom lines and have to maintain a profit margin, but environmentally it seems to me that the business of feeding animals junk food goes against the grain (better watch out for those puns). Is it energy efficient to feed animals highly processed food so that corn can be used to produce subsidized biofuel? I don't know. While waiting for a friend the other day I got a chance to go into a bookstore that I have always wanted to peruse - McNally Robinson (52 Prince St). Not only do they have a little cafe with handsome baked goods (unfortunately I had just had breakfast so I didn't get to try any), but they have a well organized selection of books and magazines. The periodicals were already looking good from afar with a couple of my favourite titles such as COLORS, the visually arresting, socially conscious magazine and Adbusters, the Canadian quarterly that is "concerned about the erosion of our physical and cultural environments by commercial forces." But the display featured a few titles I hadn't heard of, including a new-ish publication called Diner Journal. Apparently the adage "good things come to those who wait" holds true in this case; I was waiting, and a good thing appeared. 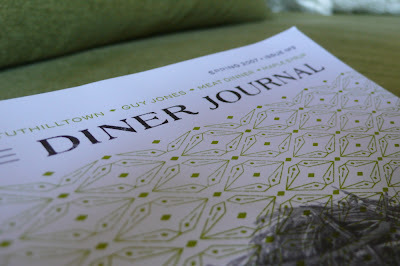 Diner Journal is a delightful small-scale quarterly published by the staff of Diner and Marlow & Sons, two restaurants in Brooklyn. Unusually, Diner Journal is committed to showcasing the restaurants' own recipes and sources for local, seasonal food. Highlights in the current Spring issue (No. 3) include maple syrup stories, an interview with Guy Jones of Blooming Hill Farm, and recipes featuring asparagus, ramps and rhubarb. Although they are not written for the novice cook, these recipes will inspire you to head to your local farmers market and try something new. Although I haven't cooked directly from the journal, I did use their advice about ramps ("use them in everything as you would garlic") inspired me to put them in an asparagus and lemon risotto to great effect. Diner Journal is not technically a zine since it is a commercial venture, but the layout and typography (and handwriting) and limited distribution (as far as I know DJ is only available at McNally Robinson or by subscription) of the publication place it in the middle ground between independent zines and bigger restaurant mags. The BLT restaurant empire has recently come out with BLT Living, a high-gloss quarterly complete with full page advertisements which is given to customers at BLT restaurants free, as reported in an article by Florence Fabricant in The New York Times. Diner Journal has no advertising (but has a cute grocery-style price tag of $7.50 on the inside cover) and comes with three hole punches down the side to help you store and reuse it. A short piece in New York Magazine also contrasted Diner Journal with BLT Living, but likened it to Chez Panisse publications, which I have never had the fortune of reading. There must be many more small, worthy food publications, so I'm on the lookout. You know you've used it, but does it work? Yesterday in The New York Times, Harold McGee wrote an article on whether we can actually trust food that has been on the floor for less than five seconds. According to him, there is truth behind the notion that the longer food is on a surface the more bacteria it picks up. However, very small numbers of some microbes can still make us sick. Hence, McGee gives us the updated rule: "If you drop a piece of food, pick it up quickly, take five seconds to recall that just a few bacteria can make you sick, then take a few more to think about where you dropped it and whether or not it’s worth eating." Sounds reasonable to me. For all of the frozen yogurt lovers who were as disappointed with Pinkberry as I was (see the post), I think I may have found a good alternative. Heidi Swanson over at 101 Cookbooks just blogged about a great recipe from David Lebovitz's new book, The Perfect Scoop. It's simple (containing just yogurt and sugar, with optional vanilla) and adaptable, so you can make the frozen treat to your taste at home, which I am going to try as soon as possible. 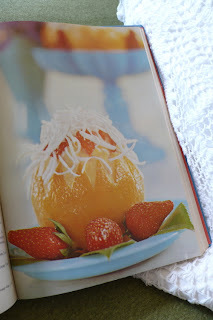 Check out her post for the recipe and gorgeous photograph. When I was upstate last weekend I did some cookbook shopping – one of the only kinds of shopping it is important to do on a full stomach. I bought a couple of books to add to my NY library, which made the collection a grand total of four. But then friendly brown box came in the mail this morning; and then there were five. I miss a lot of the cookbooks that I left in London, particularly my collection of Nigella Lawson's books and, now that it's springtime, my River Cafe Two Easy by Rose Gray and Ruth Rogers which contains lots of great ideas for fresh vegetables, antipasti, pasta and fish. I rarely follow a recipe word for word (though I'm sure this is not a good thing) so I don't miss having particular recipes, but I do miss the inspiration that a flip through a great cookbook can give. The only "inspirational" type book that I have here in New York is Nigel Slater's The Kitchen Diaries. The photos themselves could melt in your mouth, and as the focus is on seasonal eating, it's great for a quick peruse before or after a trip to the farmer's market. I feel that every recipe collection should have a basic "methods" cookbook which will actually teach you how to make things, no matter how competent you think you might be. Mark Bittman's How To Cook Everything fills this position in my NY collection, appropriately since he is a food writer for The New York Times. His cookbook is a modern take on the basics, and contains a refreshing mix of multicultural recipes. The "pasta" section, for instance, contains authentic recipes for penne arrabbiata, cold soba noodles and pad thai. Clear black and white illustrations explain the most complicated steps visually, and there are lists of basics gadgets and tools that are necessary, and others that are not. Other cookbooks that can the same purpose as this in a recipe collection include The Fanny Farmer Cookbook and Delia Smith's Complete Cookery Course to name just a few. I find that allegiance to these cookbooks is often passed down through generations, hence the sustained popularity of seasoned classics such as The Joy of Cooking which are regularly updated. An outdated retro-classic was one of my two purchases last weekend. 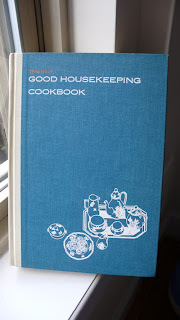 The 1963 edition of The New Good Housekeeping Cookbook shows its age with recipes like "Chicken a la King Surprise" containing just one package of frozen chicken a la king, 4 bread slices and sharp cheese spread. I will not be making that any time soon. There are also guidelines for the "glamourous serving" of vegetables, in fact the whole book encourages you to "serve with a flair" - see the "Snowy Orange Cup" on the right. Not my cup of tea either. However, there are recipes for old stand-bys that I will try, like candied sweet potatoes and a coffee cake which, surprisingly, contains fresh ground cardamom seeds. That's more like it. The other two books in my collection are part cookbook, part memoir, and both are in my pile of books to read. M.F.K. Fisher's With Bold Knife and Fork contains foodie anecdotes and a few recipes, and follows the structure of a traditional cookbook from appetizers to drinks and desserts. Barbara Kingsolver's new book Animal, Vegetable, Miracle retells the story of her family's quest to eat locally for a year. Reviews to follow. A friend recommended Hudson, New York to me as an antique shopping destination that is easily accessible from the city. Just a two hour train ride from Penn Station, Hudson is fast becoming a home away from home for urbanites not only with a keen eye for art and architecture but with a keen palette, too. Once a prominent port and industrial city, Hudson fell into decline in the late 19th century when prostitution and gambling became the most prominent trades in the town, as documented in Bruce Edward Hall’s book Diamond Street: The Story of the Little Town With the Big Red Light District. After years of recession and decay, Hudson is regenerating thanks to the foresight of antique dealers who took up shop in some of Hudson’s charming period buildings in the 1980s. 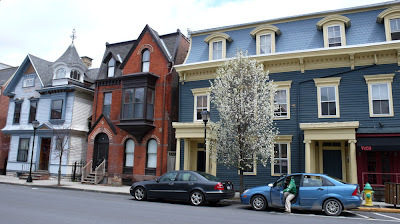 A walk up and down it’s main street, Warren Street, showcases many pristinely refurbished Victorian homes, but the revival is still underway; fixer-uppers are not hard to find, either. They include the town's opera house, which is partially refurbished as a community arts center with exhibition space, but whose main auditorium still awaits refurbishment. Visit the Hudson Opera House (327 Warren Street, (518) 822-1438) or their website for before and after pictures, details of exhibitions and a history of the building. Architecture and design treasures are not the only ones to be found in this town; there are plenty of cultural and culinary riches on offer. Our trip took us to many antique and junk shops with tempting offerings like vintage Pyrex bowls and mid-century flatware. Bookshops are my favourite places to while away a few hours on holiday. Hudson City Books (553 Warren St, (518) 671-6020) has a good selection of used cookbooks, from practical classics like Mollie Katzen’s The Moosewood Cookbook to tomes like Jeffrey Alford and Naomi Duquid’s coffee-table worthy Hot, Sour, Salty, Sweet. At The Spotty Dog Books & Ale (440 Warren Street (518) 671-6006) you’ll find an expertly chosen selection of books including, but not limited to local history, cooking, and baking and you can be even more leisurely in your book shopping by pausing at the bar for a local brew. The atmosphere is young, friendly and focused on community – The Spotty Dog hosts lots of events, including a quiz night. Here you’ll find an expertly chosen selection of books including, but not limited to, cooking, baking, wine and beer. 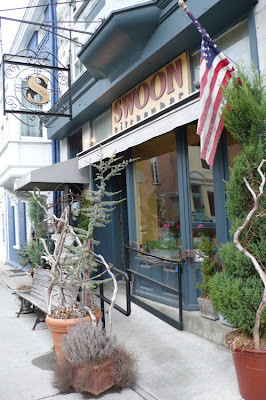 The culinary highlight of our trip was dinner at Swoon Kitchenbar (340 Warren Street, (518) 822-8938) on Saturday night. The place was humming Manhattan-style and reservations were essential. We sat at the bar and were given excellent recommendations by the bartender, including a very reasonable but excellent bottle of white wine and the charcuterie and gravadlax appetizers, both made in house. The terrine included in the charcuterie selection had a perfect texture midway between a smooth pate and a chunky meatloaf, and was served with sweet-sour cornichons that cut through the rich taste of liver. 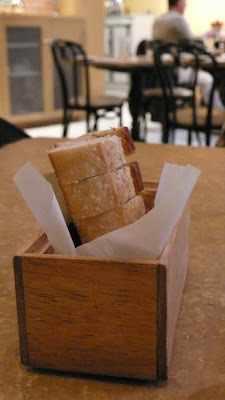 The appetizers were accompanied by fresh, warm bread. Swoon prides itself on fresh, local ingredients as evidenced by the list of suppliers on the back of their menus, which change daily. Our fantastic meal continued with homemade papardelle with duck gizzard confit and wild mushrooms, and pan-roasted Maine monkfish. A hazelnut cake for me, and a panna cotta with rhubarb for Jan, were more than we needed, but were still happily received. The feast at our bed and breakfast on Sunday morning was the most unexpected gastronomic treat of the trip. Reading about a local bakery, Jan thought he was imagining the smell of baking wafting upstairs, but it was real. When we went downstairs to the gorgeous dining room, we were treated to a spread of cereals, fresh fruit and yoghurt, and most importantly – home made quiche Lorraine, banana bread and scones. Paul Barrett, the owner of The Country Squire Bed & Breakfast (251 Allen Street, (518) 822-9229), was a gracious host. He agreed that the quality of many restaurants in Hudson rivals New York City establishments, and recommended that we try Ca’ Mea (333 Warren St, (718) 822-0005) for its great Italian food. Unfortunately we didn't have time to get there. Looks like we’ll just have to go to Hudson again.